I’d like to think that I could afford 3 months off working to go and work in the Himalaya, but in the real world I’m lucky if I can get three weeks off. Even though I work as a Mountaineering Instructor, the summer is usually packed with work and I’ve even given up leading expeditions during the summer holidays as I prefer to work solidly and then and take some private time off in the quieter periods. So I’ve become an aficionado of the micro adventure, tours and trips that last no longer than three weeks and I believe that this is becoming the type of adventure that people are beginning to seek out. 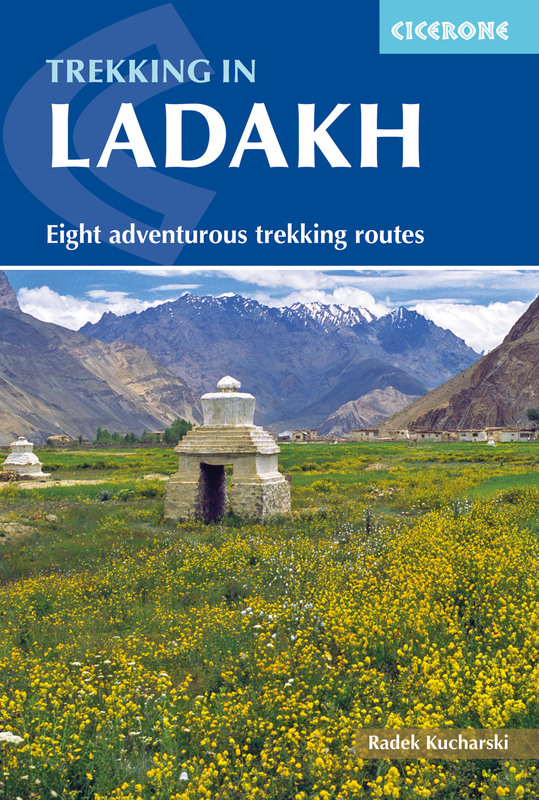 What a great pleasure it was then to have Trekking in Ladakh drop through the letterbox. Radek Kucharski (who is Polish) is very knowledgeable and has visited the area many times so the book has a wealth of technical and historical information that is more than enough to give the seasoned trekker the information they need to complete one of the described treks. He offers 8 adventures from the popular and classic Padum to Zanskar 8 day trek with homestays to the more wild and remote Tsarab Chu, a difficult and remote 12 day trek so expert and seasoned trekkers. All the routes are well described, with accommodation options given and the difficulties described in detail. The mapping is basic but gives you a full flavour of the route with major peaks, rivers, passes and camps/villages. Most importantly Radek discusses your water options for each day of the trek as well as a good descrition of how your day is likely to pan out. I really like the style of Radek’s writing, he comes across as someone I would like to trek with, he feels knowledgeable and has a great respect for the environment he is travelling through and a curious nature when encountering the peoples. He has really encouraged me to give the region a proper look and hopefully to plan a trip in the near future. So, why would you go to Ladakh? Well if you get there quick enough it really is unspoilt, the region is entirely within India and feels more Tibetan than you’d realise. So you get a flavour of Tibet with the restrictions that a visit to Tibet often entails. The region falls outside the normal Himalayan monsoon region and being at altitude makes it an ideal summer destination which you could complete within a two week holiday. Most of all though the whole region has a remote and wild feel to it so if you are an experienced trekker and looking for adventure then Trekking in Ladakh might just be the book for you – it is for me and I think I’ve got myself my next micro adventure!